This year is only halfway through, and we’ve already had so many incredible sets announcements. Sets like Assembly Square, Carousel, Ninjago City, Destiny’s Bounty and Old Fishing Store have jumped to the top of my must have list, and I know I’m not alone. I honestly think that LEGO has raised the bar this year, so I’m really excited to see what happens next. 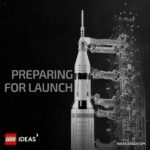 Included in this astounding list was 21309: NASA Apollo Saturn V. After a year of secrets, news was released in late April to a huge amount of excitement. We were going to get the biggest LEGO Ideas set to date. 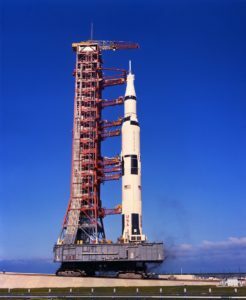 If you’ve been living under a rock or up a large tree for the last 48 years, Apollo 11 was the first mission to successfully land astronauts on the moon, and the Saturn V was the rocket that got them there. This rocket was a monster. It was 111 metres tall (around 36 storys – taller than Big Ben and the Statue of Liberty), weighed in at 2.8 million kilos fully fueled, and was the most powerful rocket that had ever flown successfully. If you want to read more, I’d highly recommend checking out the NASA website. 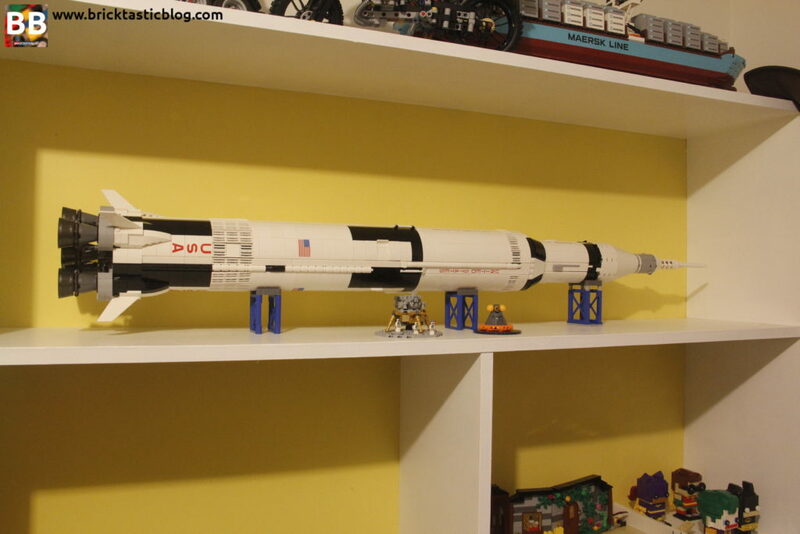 The LEGO version is 100 cm tall (1:110 scale), and comes in three separate sections that all join together to mimic the launch sequence, but more on that later. I don’t normally talk about the box or instructions, but being a very special set, it’s certainly warranted this time. 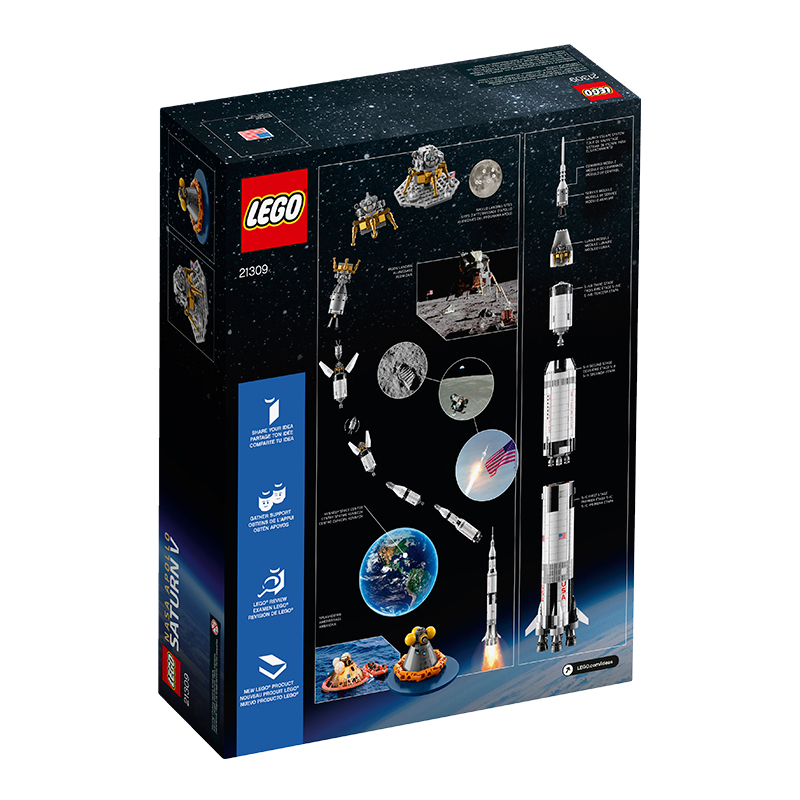 The front of the box displays the rocket in all it’s glory up in the stars, as well as a little vignette of the astronaut microfigures on the moon with the lunar lander and flag, as well as a blueprint and the Apollo NASA logo from the 1960s. The back has loads of facts, including the progression from takeoff to landing on the moon, as well as more detail on each stage. The instruction booklet is equally as appealing. From the front, it looks like a well worn workshop manual. 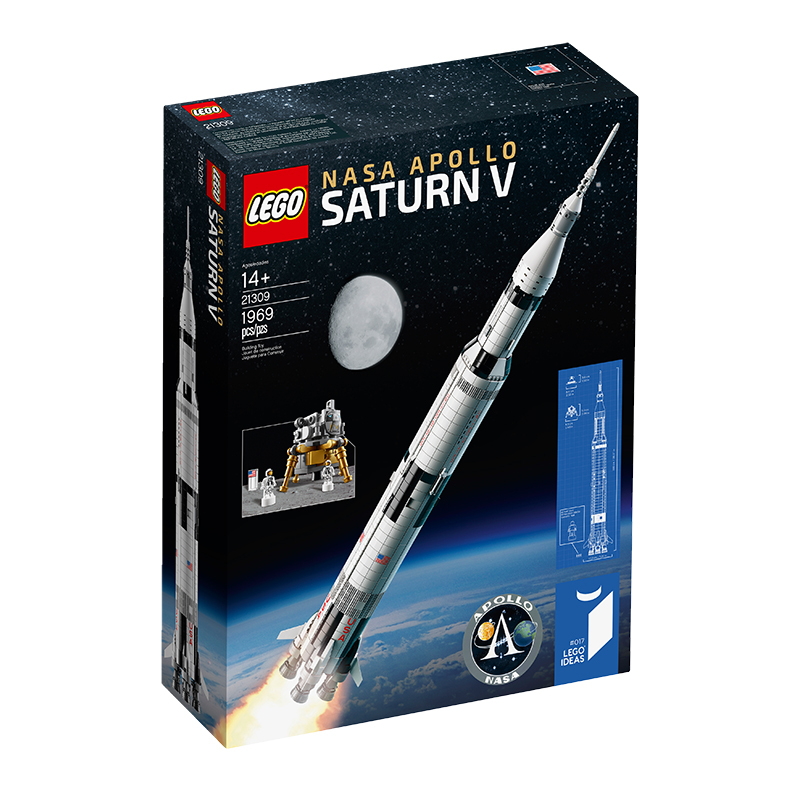 Before the building fun begins, there’s information and photos about the Apollo Program, the Saturn V itself, what happened along it’s journey to the Moon, and finally the fan and LEGO designers themselves. 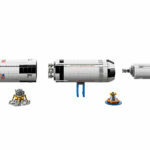 There’s some words from Felix Stiessen and Valerie Roche on their design, and then some input from Carl Merriam, Mike Psiaki and Austin Carlson as the LEGO designers. It was great to see that the LEGO designers were just as excited as we were to get their hands on this set. Inside the big box are 12 numbered bags and the instruction booklet. No stickers! Hooray! I will say straight out that the full set is quite difficult to photograph, as it doesn’t even begin to fit in my light box! I’ve made do, but the photos won’t be as pretty this time. There are some excellent elements in this set, and not only that, but the number of elements is special. There’s 1969 elements, which is also the year of the Apollo 11 Moon landing. While there aren’t any new moulds, there are loads of re-coloured and printed parts. First of all, there are four each of the 1×6 tiles that say UNITED and STATES, as well as one 1×8 tile with black dashes. There’s four2x3 curved slope bricks that have the US flag, as well as four of each of the letter slopes to spell out USA. There are also the new tubs in Titanium Metallic that are used for the rocket cowlings, the 1×1 round plate with grip shaft in white. 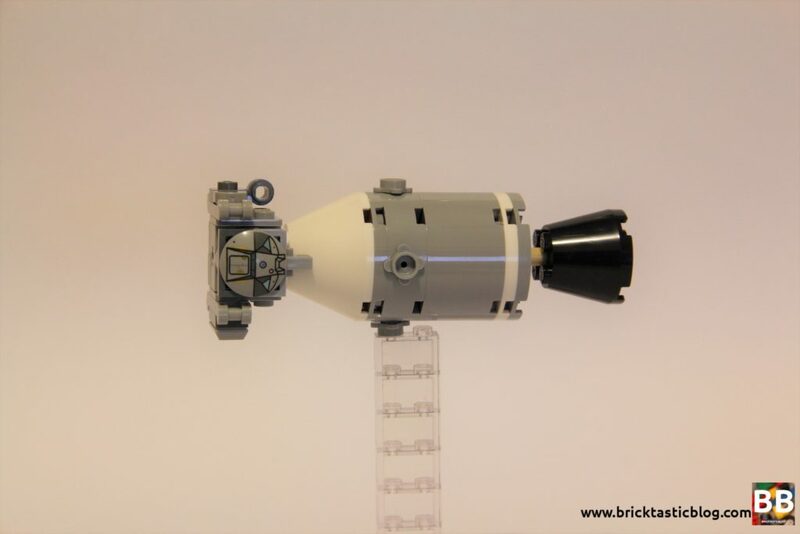 There’s a printed Rocket Step 4x4x2 used in the command module. There’s two of them – one inside the rocket, and one for the ocean landing. There’s the printed slide shoe for the hatch on the Lunar Module, and that cute little flag printed on a 1×2 transparent tile. 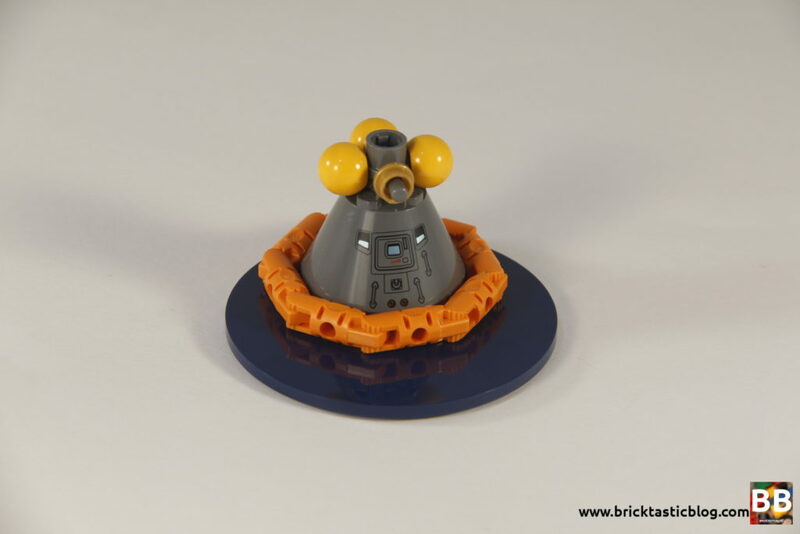 The centre of the rocket is made from 4x4x6 quarter circle wall elements, and you get a few of them, in both dark stone grey and white. Lastly, (and only because I’d be here all day if I listed all the interesting elements), there’s the microfigures. These little guys have some brilliant and surprisingly detailed space suits printed on them, and you get four, just in case one gets lost in space. 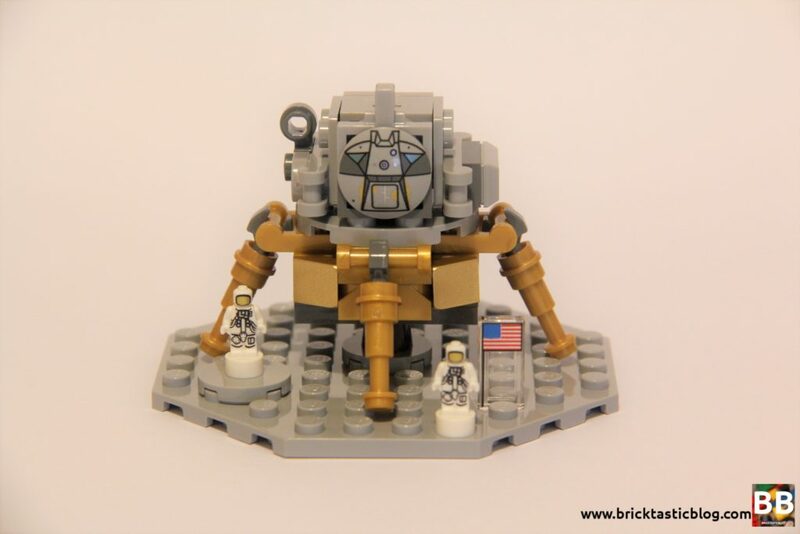 If you aren’t aware, these are supposed to represent Neil Armstrong, Buzz Aldrin and Michael Collins. This set has some excellent parts. If you were able to get your hands on a second one to part out, you’d be pretty happy. With a set this size, it may not seem very easy to swoosh it around the room, but the set is designed for just that. It’s massive and as a rocket, it just screams to be swooshed. As soon as I built it I was flying it around the house with a big dumb grin on my face! Ok, time for a bit of an Apollo 11 lesson. As we all know by now, there are separate sections to the rocket, each with their own boosters, so the journey to the Moon can be recreated. Each of the three stages would burn all it’s fuel and then break away, allowing the next stage to burn. The five massive F-1 engines would take the rocket to around 68km up, and then break off, falling back to Earth to land in the ocean. The second stage would see the five J-2 engines take the rocket to just before orbit, with the third stage using a single J-2 engine to push the craft into orbit and to the Moon. 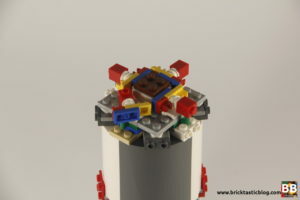 Each section of the LEGO Saturn V has bars and clips connecting them together, and they’re very sturdy, with no movement at all. I was a little scared in testing it’s strength, but I did it above the couch just in case! Once in orbit, the transposition and docking manoeuvre was undertaken. 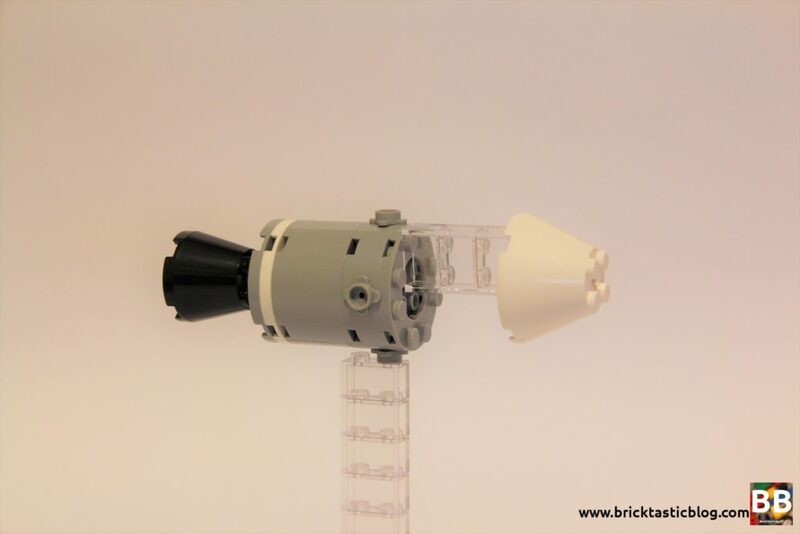 The conical covers would open up (the actual Saturn V had four, while the LEGO version has two), and the Command/Service Module (CSM) would detach, turn around and dock with the Lunar Module “Eagle”. 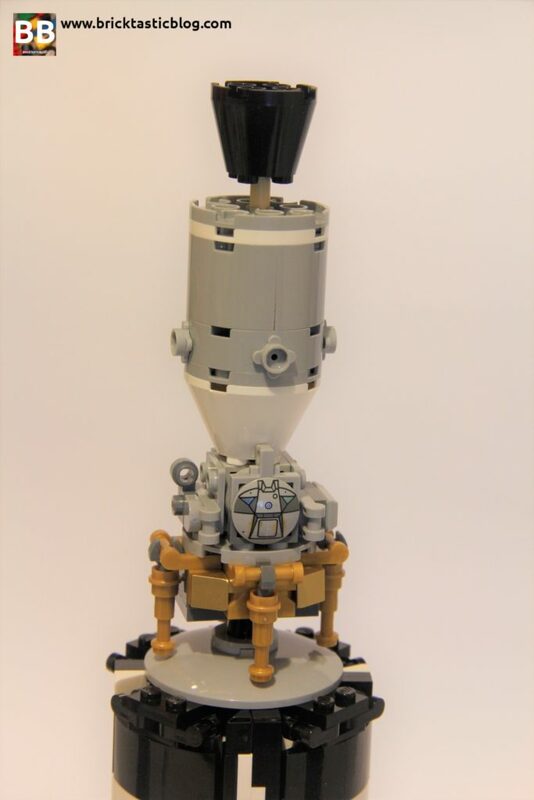 The Command Module, while white in the main build, is still also quite accurate. There was a protective shell around the CM which would come off during re-entry to stop the heat from getting too much for the astronauts. Once connected, it would take off and move closer to the Moon. Once it was in Lunar orbit, the Lunar Module (with Armstrong and Aldrin inside) would separate from the CSM and head towards the surface of the Moon. Poor Michael Collins would stay in Lunar orbit for the entire time, all by himself. 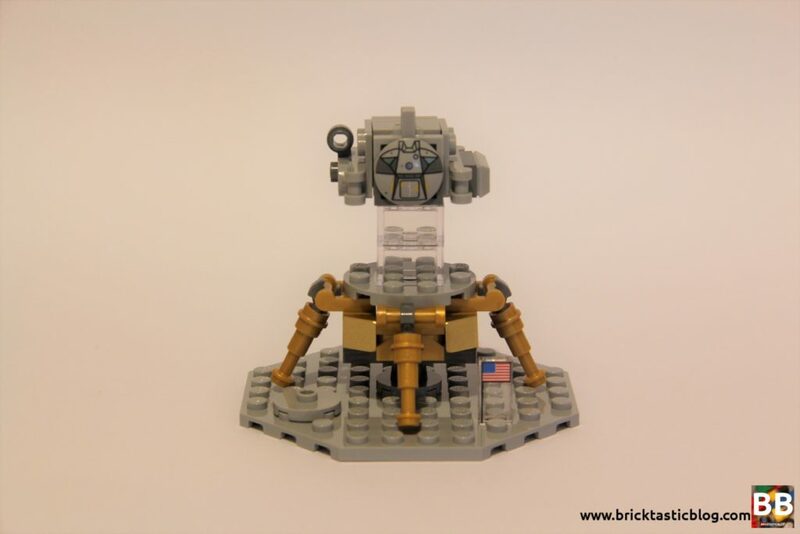 The Lunar Module was made up of two sections, top and bottom, and had a big rocket in the bottom for descent, and a smaller one in the top for ascent, to take the astronauts off the Moon and home. The Lunar Module would split, and the top section would head back towards the CSM hanging out in Lunar orbit. Once docked, the two Moon walking astronauts would transfer back to the CSM, which would detach from the Lunar Module and head back towards Earth. and land in the ocean. All of this is possible to re-enact, which is not only exciting fun, but very educational! It’s excellent. 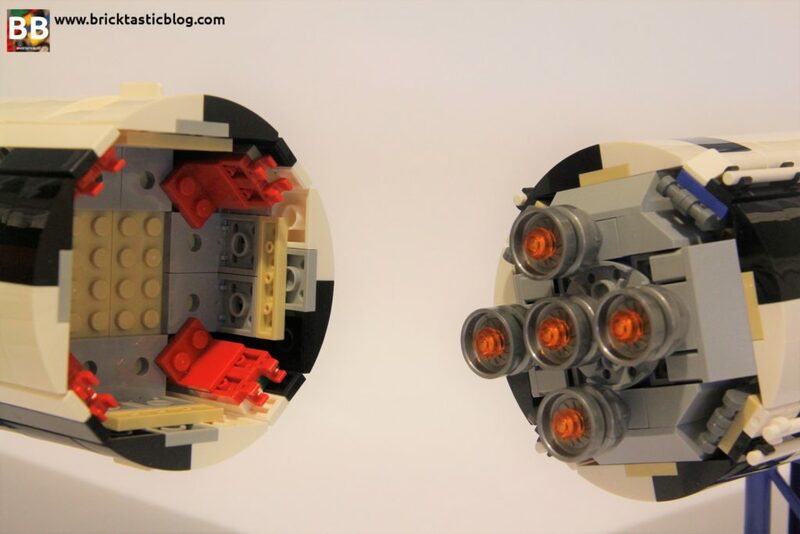 This set pushes the geometry of LEGO to it’s limit. When I showed my wife some in progress sections, she said “It looks like random parts all thrown together!” and it’s true, but it works so well. 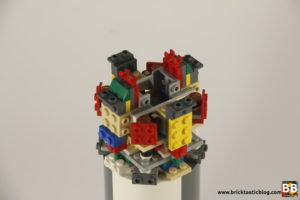 The core of the bottom stage has another cylinder inside, so it is very strong, and fits together perfectly. I’m always fascinated with the interior structures of beautiful sets, and this was on another level entirely. I’d build a section, not have any idea how it fit together, and then I’d realise what it was. The whole build process was me saying “Oh man, that’s cool”, or “Wow! That is so clever!”. Seriously, some of these SNOT techniques are mind-blowing. Not only that, but there are axles and ball joints thrown in for good measure. 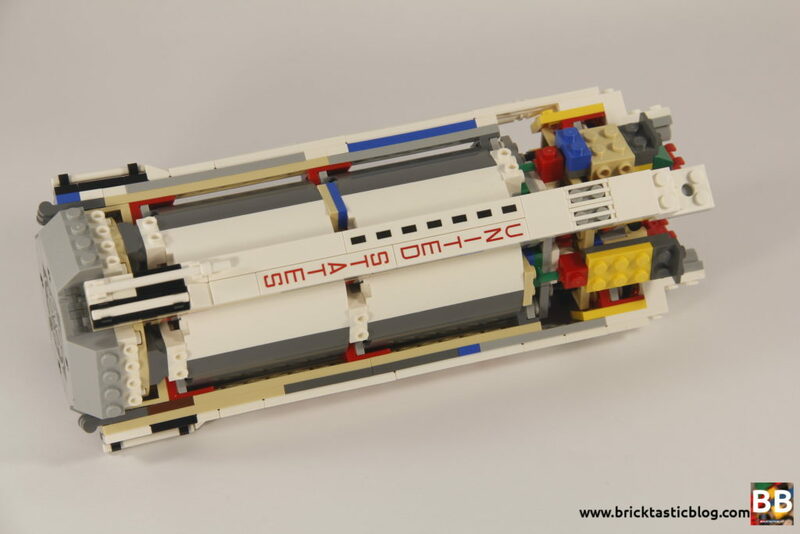 Sure, some of the sections are quite repetitive, as the first stage has larger exterior panels interspersed with smaller ones, so you’re building the same parts four times, but I didn’t care. This was such a satisfying build. I learned heaps, and I did not want it to end. There are a few little tricky parts though. As many of the SNOT elements are pivotable, in order to get the curve right, clipping some sections of the outer shell on was difficult if the SNOT element was not aligned correctly, but this is something that is learned along the way. Aside from that, I couldn’t fault this set. It’s amazingly strong for such a large set too. You’d think that it has some fragility, but it’s solid. 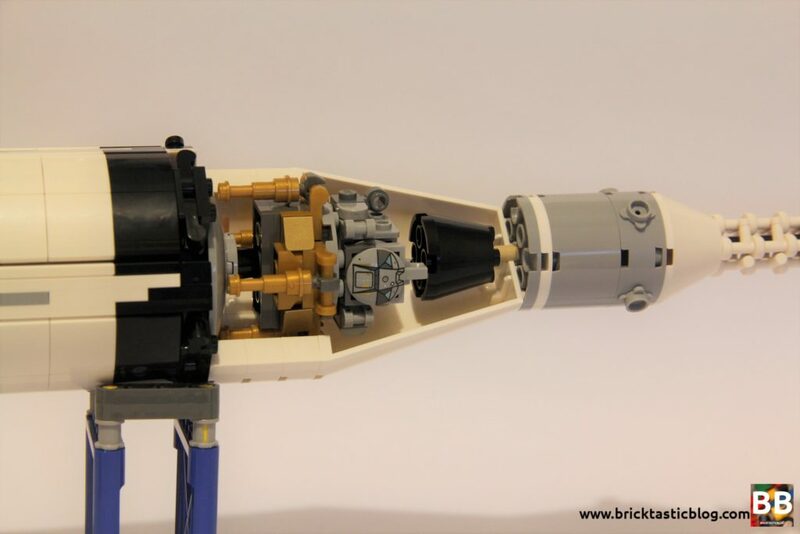 A couple of little details – I really enjoyed piecing together were the F-1 engines. 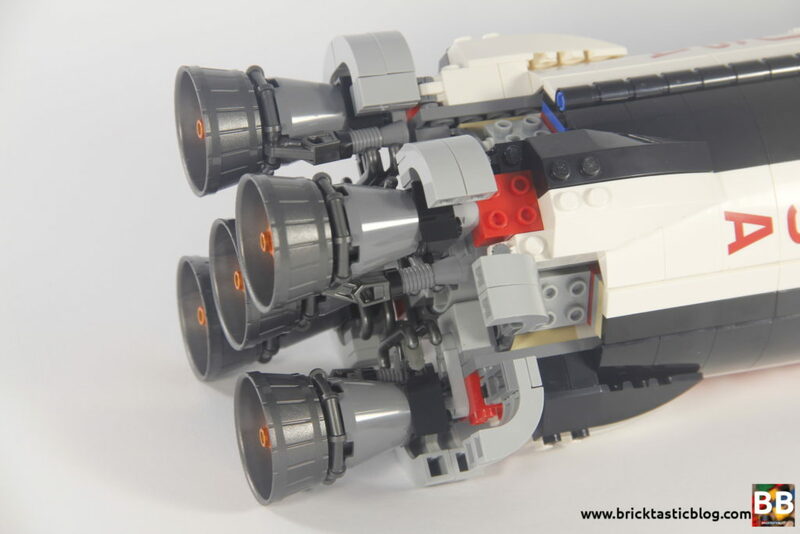 The cowling especially around where they join on to the rocket body is gorgeous, and so simple! Also, the grilled sections on Stages 1 and 2 were so clever! I had no idea what the internal structure was meant to do, but as soon as I figured it out, it blew my mind. The only way to experience this properly is to buy it yourself. Seriously, get this set. I know this section is a little smaller than normal, but I really don’t want to ruin the fun for you. It’s truly a set you need to actually build, not just watch someone build on YouTube, or have me waffling on about. It’s big, eye catching, and gorgeous. Firstly, to be able to achieve a cylindrical shape with bricks is incredible, and the interior structures that allow this to happen are insane. At the moment mine is displayed on a large shelf, but I’d love to be able to display it standing up. 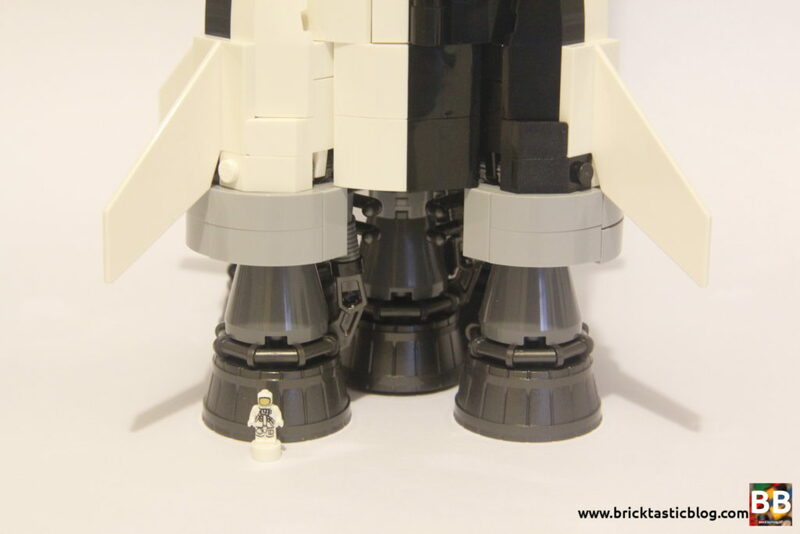 The Saturn V’s five F-1 engines provide a good base to stand on, and it takes a bit of a knock to send it toppling over. It’s definitely possible to have it standing up, as long as little (or big) hands don’t come playing! 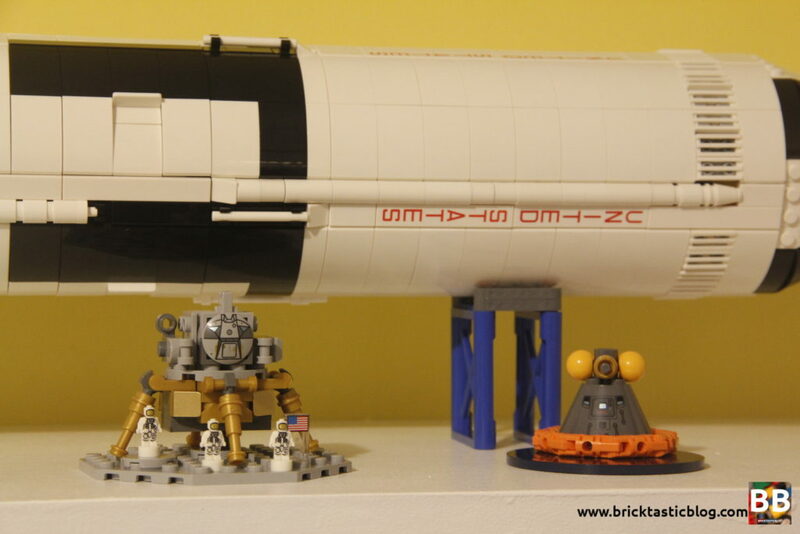 Having the entire set at 1:110 scale means that you get a real impression of just how tall the actual Saturn V would be. The microfigures barely measure up. It’s truly a feat of engineering brilliance. 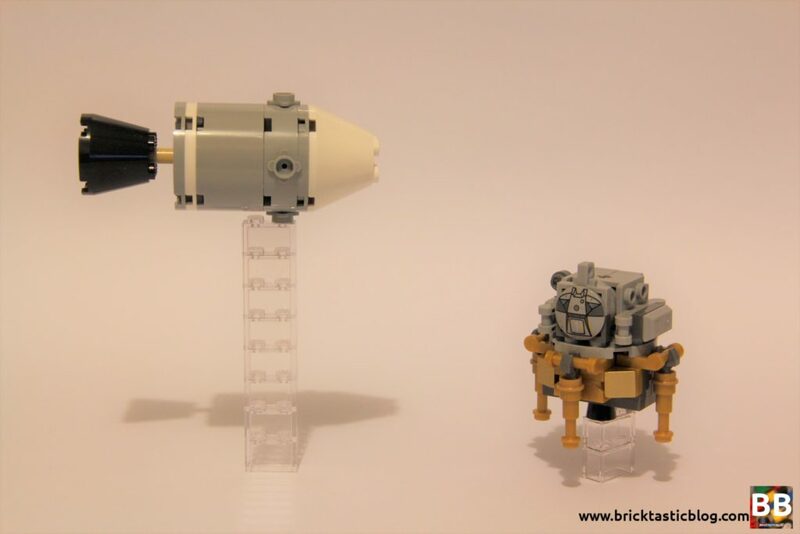 The Lunar Lander and Command Module look just as good and are immediately recognisable, and that tiny little flag tile wedged in between two studs is genius. 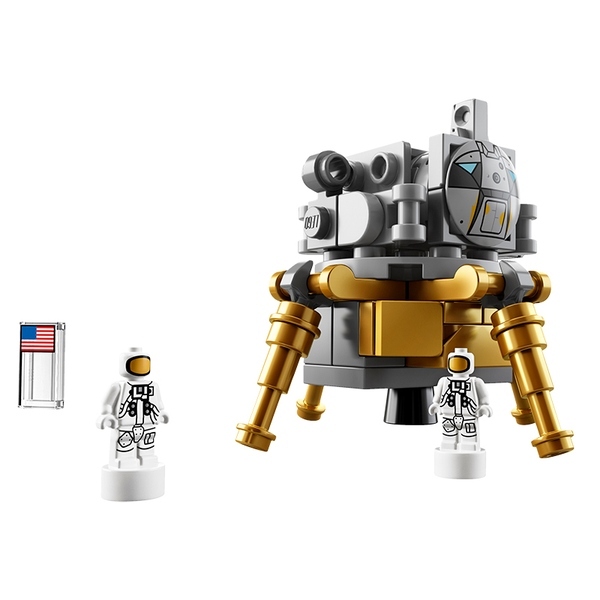 I never thought I’d see that in another LEGO set again, but I’m very glad it’s there. 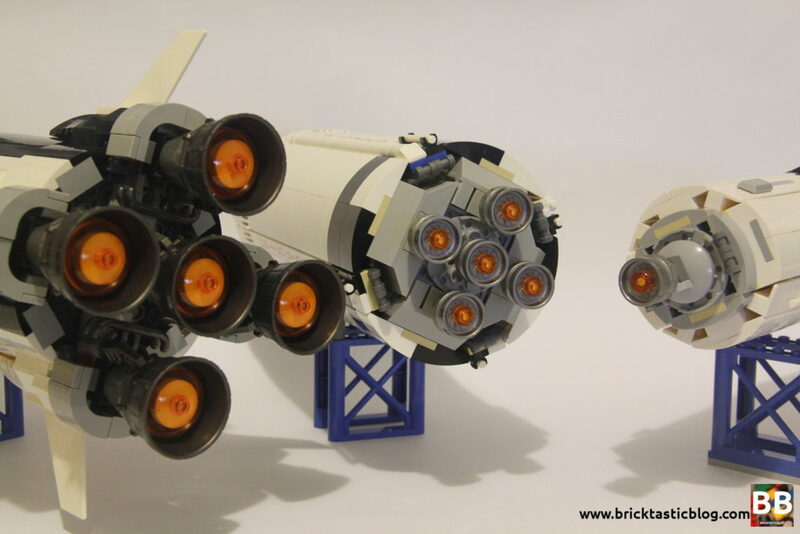 There are a couple of visual differences between the LEGO version and the NASA version, but these are purely cosmetic, and of course it had to occur, but they’re minor – the pattern around the top of Stage 2 and the fins are slightly different, but it doesn’t make a difference to me. For such a large set, you’d expect the price to be much higher, but for $170 it’s an absolute bargain. I was expecting around the $250 mark, and I would have gladly paid it as well! If you’re one of the few that will eventually dismantle the set, you’ll end up with some very useful parts for your collection. For me though, this one is staying built. 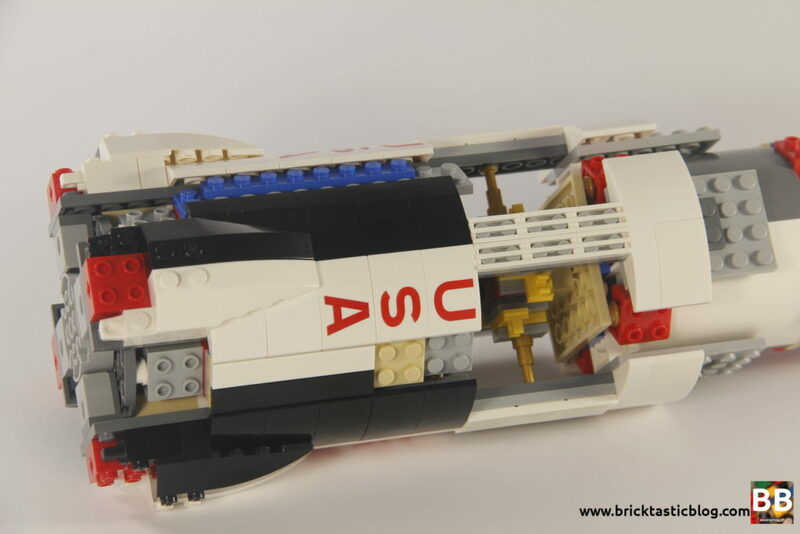 LEGO Ideas sets always score higher in my book for collectibility, as they’re often unique. This set is no exception. 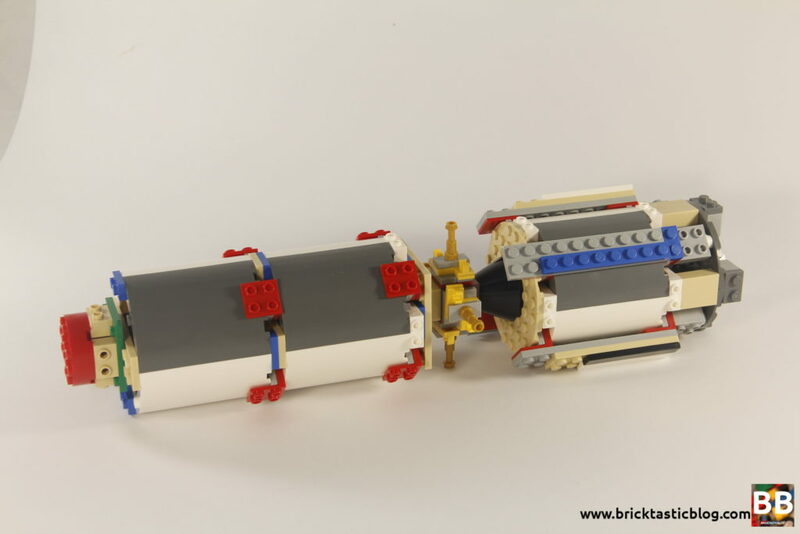 If you’re even remotely a fan of Classic Space or space in general, then this set is for you. It’s an iconic set that I believe will live on for a long time to come. If you can get it now while the price is good, do so. 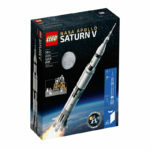 Do you have a copy of the Saturn V yet, or are you still waiting for your order to be filled? What do you think of it? Watch Adam Savage Build the NASA Apollo Saturn V!